One of Suffolk's longest dedications in a parish with the joint shortest name - and even more than that, this is one of the most sparsely populated parishes in the entire county, with barely twenty people living in it. 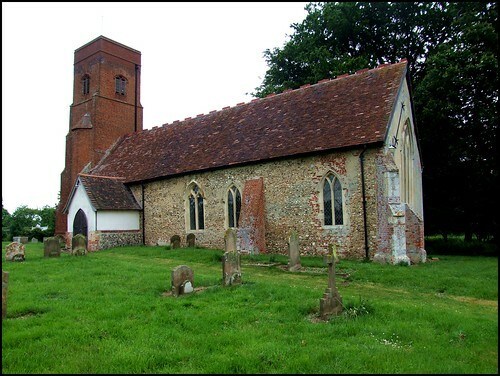 Not surprisingly, Hoo church was threatened with redundancy in the 1970s, but has ridden that storm to survive today, with regular services in conjunction with the church at Charsfield, a mile or so off, with which Hoo has long formed a joint ecclesiastical parish. The tower is 16th century red brick, the top a rather harsh modern restoration, and is most singular. If it looks familiar, it might be because this was the church in the film Akenfield. Although the book was based on neighbouring Charsfield, the graveyard of the church there was too small to allow for filming. Despite the fact that this building is not particularly historically significant, there is something very special about it. Come here on an afternoon in winter, with the shadows creeping in across the fields. Gaze out southwards across the gentle valley, with Charsfield tower peeping through the mist below. Or on a sunny day in late spring, with the hedgerows all about burgeoning, full of flowers and birdsong. St Andrew and St Eustachius is remote in the fields, with only Hoo Hall and the old rectory for company. And there can be few plainer, simpler interiors than that of St Andrew and St Eustachius. As at nearby Campsea Ashe and Easton, the nave and chancel running together form a tunnel-like effect, opening out into the light of the large east window. There is no coloured glass. The furnishings are similarly simple and homely, and all in all the effect is of the peace of a rustic space which cannot have changed a great deal since the Victorian refurbishment, apart from the addition of a couple of icons. The building seems to rest easily in the dim quietness, as if this solitude suits it. you feel that services can only be a distraction from such serenity. The dedication is unique, but I am afraid that it is not authentic. The medieval dedication may have been to St Eustace, or it may have been that there was a shrine altar to that minor saint here. After the Reformation, church dedications fell into disuse. But the Enlightenment of the 18th century saw a renewed interest in history. The modern dedication arises from a double (possibly triple) error of those days. Firstly, a misreading of 'St Eustace' by the antiquarian Browne Willis, working in the records office at Norwich Cathedral in the 1720s, and a confusion by him of Hoo in Suffolk with Hoe in Norfolk, where the medieval church was dedicated to St Andrew. He may have missed the actual dedication completely, and many of these documents are now lost. So, he conflated the two Saints into an undeniably attractive and interesting combination. When the dedications of Anglican parish churches were restored to them through the enthusiasm of the Oxford Movement in the 19th century, this was based on the work of these well-meaning but inaccurate antiquarians; Willis had published his results as Parochiale Anglicanuum in 1733. Some errors were corrected by the 1780s, when Bacon's Liber Regis was published. But not this one. Two delightful idiosyncrasies complement the dedication. One panel of the otherwise typically East Anglian font features a standing figure on a shield - who could he be? Also, the rood loft stairs are in a window embrasure as at Whepstead, Shottisham, Oakley and elsewhere - but here, they head westwards rather than eastwards. I was struck by the number of names on the First World War roll of honour. How could such a tiny parish have sent off so many of its young men? Pondering this, I came outside and found an old boy cutting the grass. We got chatting. I told him about the flooding of the ford at Marlesford, but that was nearly six miles back, and so I suppose that I might just as well have been talking about something which had happened on Mars. Suffolk is an insular county, despite its proximity to London. But its people are almost always quietly friendly, and this little church is open to strangers and pilgrims every day. And, indeed, there's no other real reason for coming here.